By their nature, standard hoses are quite versatile but they do have a couple of drawbacks when compared to their industrial cousins. They tend to be far weaker and unable to resist continuous pressure. This is where industrial hoses have the upper hand. For most commercial uses, your everyday hose is used in the home for applications that are relatively lightweight. Think vacuuming, as although it works the hose, it doesn’t over-exert it. Come to heavyweight processes though and you may find that it just isn’t up to scratch. This is where Buckley Industrial can assist you. As one of the companies at the forefront of hose innovation, Buckley can offer only the best in industrial hoses which will help your workplace to no end in terms of health & safety and the day-to-day running of your operations. With products ranging from the Flexible Metal Hose to Stainless Steel Hose, there’s a great variety of products to consider. As soon as you start working with Buckley, you can be assured that you’ll be receiving the utmost in customer attention and attention to detail. Purchasing a hose alone may not be enough to cut it when you consider the breadth of your operations and how high-maintenance they may be. 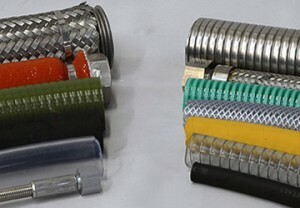 This is where items such as hose couplings and fittings are most desirable as not only do they provide the necessary connection to the material source, they are also made of top quality fabrics meaning they will be more than able to stand the test of time, as well as to not suffer from a lack of performance. Additionally, it may be worth looking into variations of a hose to help you distinguish which form is best suited for you and your business. Based on the produce that will be passing through it, you should always ensure that what the hose is made out of is not easily degradable. Finally, look to flexible connectors if you require the premier in hose versatility.